What drawer box material would you like? OUR STANDARD DRAWER BOX. CREATED FROM FSC HARDWOODS, WITH A 1/2" THICK PLYWOOD BOTTOM FOR AN EXTREMELY DURABLE AND BEAUTIFUL BOX. MADE FROM BEAUTIFUL 5/8” THICK BALTIC BIRCH PLYWOOD. EDGES EXPOSE THE ENGINEERED BIRCH STRANDS FOR A HANDSOME, MODERN AND WARM LOOK. VERY DURABLE, BUT WITH A SAVINGS OF $35 OVER OUR STANDARD MAPLE DRAWER BOX. 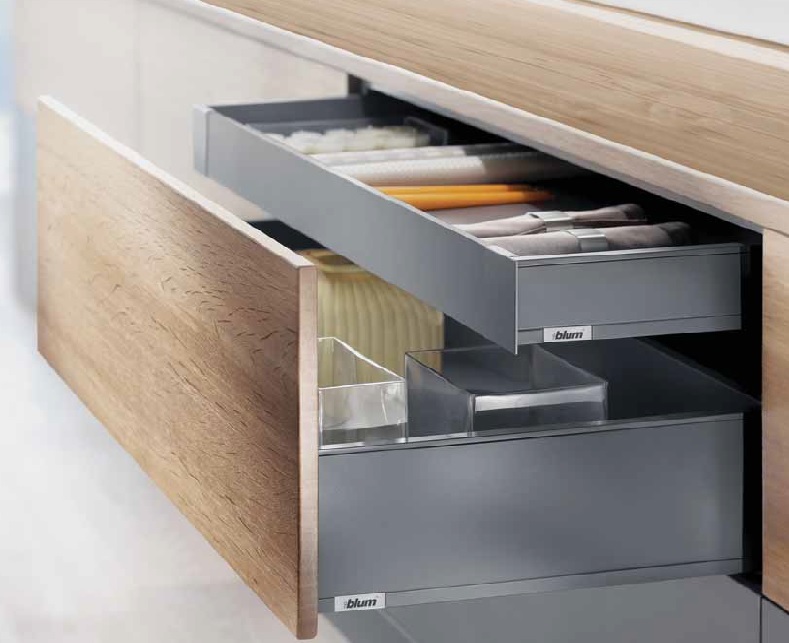 USING THE BLUM LEGRABOX METAL DRAWER BOX SYSTEM WE CAN UPGRADE YOUR CABINET INTERIOR IN A SLEEK, MODERN AESTHETIC. OUR PREMIUM LEVEL DRAWER FOR MODERN KITCHENS HAS BEEN ENGINEERED FOR A LONG-TERM LIFESPAN, AND QUIET AND EFFORTLESS USE. $35 ABOVE THE COST OF OUR STANDARD MAPLE DRAWER BOX. TURN YOUR CABINET INTERIORS INTO JEWEL BOXES BY INCORPORATING PREMIUM WOODS SUCH AS WALNUT (PICTURED), CHERRY, AND OAK AVAILABLE FOR A MINOR UPCHARGE. DOVETAILED CONSTRUCTION USING FSC CERTIFIED HARDWOODS AND THICK PLYWOOD DRAWER BOTTOMS.